Summer school begins this week. The first session of my class The Teaching of Mathematics begins tomorrow. In addition to reviewing the syllabus and work of the semester, we spend a portion of our time thinking about math and why it is so important in our daily lives. "You know, you can think of almost everything as a math problem." On Tuesday I start having problems. Through the eyes of a child we see that getting dressed, eating breakfast, catching the school bus, eating in the cafeteria, English, P.E., geography and just about everything else is related to math. How are these "problems" solved? With math, of course! At this point the students are given a math attitude and anxiety assessment. Using a Likert scale they respond to a variety of statements like these. Mathematics is very interesting to me, and I enjoy math courses. My mind goes blank, and I am unable to think clearly when working math. I am interested and willing to acquire further knowledge of mathematics. Math has contributed greatly to science and other fields of knowledge. Artists and writers as well as scientists need an understanding of math. I feel a sense of insecurity when attempting mathematics. Mathematics is dull and boring because it leaves no room for personal opinion. Math helps develop a person’s mind and teaches thinking skills. There is nothing creative about mathematics; it’s all about memorizing formulas and algorithms. After this I ask students to think about what a world without math would look like. This is where I used to read a poem from Marvelous Math: A Book of Poems. Here is an excerpt. This year I'll ask students to read and discuss the poem in small groups. After a brief class discussion I will follow with a reading of Missing Math: A Number Mystery by Loreen Leedy. In this new book (2008), Leedy shows readers what happens when the numbers all over town suddenly vanish. Beyond the obvious delight some children will have when they recognize that math can't be done (for shame! ), they will soon recognize the dire situation we face without numbers, when we can no longer play sports (no scores), watch television (no channels), elect officials (no votes), send mail (no addresses), nor do lots of other things. 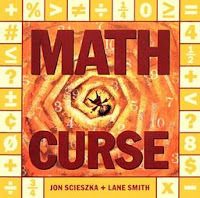 This book is an imaginative romp through a world devoid of numbers that makes readers really take stock of the value of numbers and math in their lives. You can view the trailer for an inside look at the book. All this takes about 45 minutes. It opens up a healthy discussion about the value and importance of math, while modeling for students the importance of integrating reading (poetry and children' literature) and other literacy skills (speaking and writing) into the mathematics curriculum. It also gets students thinking about real world connections and the ways in which they will need to begin thinking about how math is used. I want every teacher who leaves this class to be able to respond to the question "When will we ever use this stuff?" in meaningful ways, and I want them to have more than one answer! Here are some resources I ask my preservice teachers to explore as they think about this question. It's a Math World is a WebQuest in which students are asked to create a book that answers this question. What Good is Math? is a site for students that attempts to answer this oft-asked question. Math in Daily Life examines how we use math to get things done, from cooking to decorating to playing games. Get Real: Math in Everyday Life provides some examples of real world connections to math and suggests links to explore these ideas. When a sixth grade class talked about math in everyday life, their teacher put their ideas together in Math is Everywhere! MathPulse.com has a series of articles about how we use math every day. What do you do to help your students (young or old) think about the importance of math in their lives? I am finding myself in the rather awkward role of teaching my 7 year old math-- he loves it so that he is panting to move on beyond what he's being taught at school. And I myself grew up with a dismal attitude toward it, thinking of it as something boring to be rushed through as quickly as possible...So I am trying to retrain myself to think "math is fun!" and respond cheerfully when he says, "Mama, can I have some equations to solve?" Our ongoing practical problem is determing when the chickens will have laid enough eggs to pay for the initial outlay of $37...which they haven't yet. I will look out for some of the books and web sites you mention- Thanks! I always learn so much from your thoughtful posts. Thank you for all your effort. Regarding your post about the importance of linking math & literature, I thought you'd be interested in an article from yesterday's New York Times about the "new humanities," an attempt to bridge the divide between sciences and humanities in higher education. Oh, how I *WISH* I'd been in your summer school math class. I, too, was raised to think I was stupid in math and would never get any better, and like most kids with a high verbal acuity -- most girls, anyway, I was shunted and shoved towards English. Yet long division relaxes me. The idea that there's a place for everything, it will all work out to zero or it will work out to where it won't divide any further -- that's a concrete idea that I really enjoy. Too bad I didn't learn to enjoy it until I graduated from college and took a remedial course for myself. Oh if only all math teachers were like you. It seems to me that math may be our greatest area of need in elementary school. It's also become one of my favorite things to teach. I might have found this love sooner if someone had shown me the sort of things you are showing these students. I really got a lot of help by this blog of yours.actually i had to make a project on importance of measurement and maths so..........thanks a lot for the help.i am glad that i wrote on your blog and also would speak to you some time.